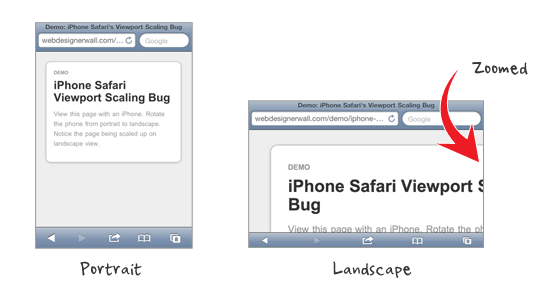 Those who create responsive design for iPhone may be aware of the viewport scaling bug in iPhone Safari. The bug occurs when you set the viewport width to device-width and rotate the phone to landscape view. To see this in action, view the bug demo page with your iPhone and rotate the phone from portrait to landscape view (you should see the page being scaled up). This is a known bug for a long time. Today I’m going to share some tips on how to fix this bug. View the demo page with an iPhone and rotate the phone from portrait to landscape. A quick fix to this issue is by setting maximum-scale=1 in the viewport meta tag. This fixes the problem, but the downside is that the page will no longer be zoomable with the zoom gesture. You might want to use comma instead of semicolon in the viewport tag. Seems to trigger some errors in some browsers. Sweet, the ‘,’ got rid of an error in Safari. Thanks! Nice tip too Nic. I use the meta tag fix, I don’t mind that it removes manual zooming, we’re generally trying to imitate native apps anyway, and you can’t zoom in on most native apps. Does anyone know if the scaling bug is still present in iOS5? Yes, and it’s not a bug. The JS solution offered doesn’t work after the user starts to zoom in / out of the page. If they zoom in, then back out, and then change orientation, they’re met with the same scaling bug. I also tried the Adactio solution referenced, but the script there hung up my page and it never fully loaded. Not sure why. I second that from Russell, after zooming in and rotating backwards / forwards once the same bug is presented. In this case, the meta solution is a much better solution. Thanks for sharing. This tutorial will help me. This great articles, I prefer the java-script matter. I wish I can contribute some viewport idea, but I don’t have such knowledge. Thanks again, I look forward to seeing more posts like these. …which fixes the original issue and allows you to set whether to allow user scaling or not. Tks for the tip. Hope Apple fix it. I’m pretty sure as long as your site is 980px wide or less, that won’t happen. I normally add this meta tag for all website that i made for mobile devices, the user shouldn’t be able to zoom in and out too. …fixes the issue describe above and still allows you to set whether the page is resizable by the user or not. This one sounds like the best solution. Thanks, Ian! This fix by Ian works perfectly, why is this not in the article? This doesn’t work generally. I can’t even find a combination where it does. Ian, you’re correct, and this works great. this is definitely some major bug. apple should really work on this one. I don’t like the viewport solution, and the js-fix isn’t any better. setting hard maximums and minimums on scale may result in unusable websites. especially if zooming is essential to your website. I’m astonished this still hasn’t been fixed in iOS5. To be honest, my view is simply to disallow scaling as opposed to using hacks. If your responsive layout is done correctly, i.e, fonts are set well and nothing is too small, there shouldn’t really be a need for a user to zoom-in. Native apps are fixed – users are used to this, so you could argue why should a considered responsive website/web app be any different? Of course, there will always be exceptions. I absolutely hate when this happens on my site. I need to fix this asap. thanks for a short and sweet post. After house of weeding through posts, trying supposed fixes (including this one), creating my own fixes… this was the thing that fixed my issue. Many thanks. I owe you a beer. http://www.1hunnit.com | #1 Trusted for Webhosting SSL Certificates Reseller and MORE!! Insightful post here. Very effective tutorial for iphone bug problem solution. Any idea on how to modify this script to make it work when the initial scale has to be 0.5 instead of 1.0? — Please, any help is always welcome. Thanks, thats new to me! This is very useful for me.Can you share with us something more like this ??? Thanks. Nice useful article.Thank you for sharing. Boo ya! Finally, a definitely solution to this symptom. I dig it. I couldn’t get the JS to work, but the meta tag was perfect. Thanks for sharing the info. Great site BTW. I was actually just here a few days ago studying your technique for a fixed column in a responsive layout. Thanks again. So far as I can see setting the actual width accomplishes the same thing as setting to device-width, at least for me, but if it clears up the scaling bug then obviously that is what I should go with. I would appreciate any feedback on this. In my further testing, I find that setting the width to an actual pixel value rather than device-width makes this scaling problem go away completely. I also find that it is hard to reproduce the scaling bug when using device-width. Oddly, it happens consistently on your own demo page, yet in my recent experiments I was able to reproduce it only once in several hundred orientation changes. This to me seems more of the nature of an odd quirk that sometimes but hardly ever happens, yet clearly on your demo page it happens consistently. The major difference between your code and my experiments is that I don’t use “initial-scale=1.0”. It seems to me that it is this that may be responsible for the ‘bug’ as a consistent event. It even gets the initial scale wrong, and scales inconsistently when moving from landscape to portrait. I was developing a landing page using less framework and was wondering why the iPhone wide layout wasn’t scaling correctly. I have tried your fix and it is now scaling perfectly. That is a nice one, thank you. That’s a good tehnique, thank you. This script works although it needs to be updated so (as people above pointed out) when you change orientation, it snaps back to just the viewport width. Another point to make is that yes, setting maximum-scale=1 or user scalable=no solves this problem, even with very well designed responsive sites there will be people who will need to zoom in for some content. There are many situations where this could be the case and you cannot design for every device. It’s just good practice to include as much accessibility in your designs as possible. No, Gavin, your observations are correct. Read the first two comments of the authors of the script at https://gist.github.com/901295 . Thanks for info..greating..succes for you.. Your articel its verry good..thanks for share..see you articel again.. Same problem in my Projects, Hope this will help me to fix my view port problem. Thanks a ton. Apple should really fix this as it was hard to troubleshoot. My implementation works in every desktop browser back to IE7, Android, WP7, Opera Mobile, but didn’t work on iPhone/iPod. Its actually the initial-scale setting which causes this bug (not the width=device-width) as mentioned above. If you try it with just the width=device-width option it scales fine. Hai..greating..your style writing its verry good, full of info, i like all about your web, please visit my blog , thanks.. Toko bunga medan .. I don’t think this is really a bug. It’s just iOS device trying to keep consistent viewport when you switch from portrait to landscape view. Assuming you have width=device-width and initial-scaling-1.0 declared, when you view a site using iPhone in portrait view, viewport width is set to 320px with scaling of 1.0. Switching to landscape view, viewport width will then change to 480px (because you declared it to). But the current viewport area will not change. What changes is the scaling (since you only declared initial scaling), so you end up with a viewport width of 480px with scaling of 1.5 which shows 320px of content, same width as what you started out with. That’s why restricting scaling fixes it. 1. When you first hit the webpage and try to pinch and zoom it doesn’t work – but works the second time you try. 2. Zoom out while in portrait mode then go to landscape mode – same problem comes back. Yup, I have observed the exact same problems. I suppose the JS needs some more work (well, really mobile Safari ought to get fixed). Still, it’s better than nothing so thanks for sharing this! Switching to landscape view, viewport width will then change to 480px (because you declared it to). But the current viewport area will not change. What changes is the scaling (since you only declared initial scaling), so you end up with a viewport width of 480px with scaling of 1.5 which shows 320px of content, same width as what you started out with. That’s why restricting scaling fixes it. Anyway, it turns out that I was using setting initial-scale and minimum-scale, which was screwing up my layout in portrait orientation. When I took those two things out, voila. So much information on this topic is written in the same old fashion. You have brought new life into this subject matter with your fresh views. I agree with you…. Appreciate this fix – works for me on apple devices.